Our project is concerned with cultivating the minds of orphaned and vulnerable children (OVC) in Ethiopia and Zambia so that they may grow up to be enlightened, culturally sensitive and globally aware adults. This project will install much needed technology literacy centers to be publicly available for all OVC in the area. We believe that promoting technology literacy among this group of children will place them in a strategic position to benefit both socially and economically in a world where the application of technology is becoming increasingly essential for improving one’s prospects for future success. 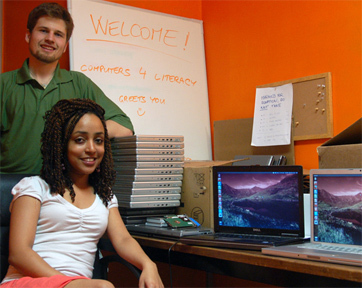 Computers 4 Literacy ~ C4L ~ was founded in the summer of 2011 by Middlebury College students and recent alumni. The mission of C4L is to spread computer literacy among orphaned and vulnerable children (OVC) by setting up technology literacy centers within OVC communities in the developing world. We do so by raising donations of used computer equipment that we process and give to our community partners. We then work with them on developing curriculum that best suits the given environment. Currently, C4L’s community partners are in Ethiopia (Betesab) and Zambia (SOS Children’s village). Until now, C4L was working towards securing equipment donations. We have received substantial donation of computers for these sites and we are using our office space at Old Stone Mill to work on the donated laptop and desktop computers. We are examining their functionality, reformatting them, and installing Ubuntu – a free, user friendly, secure operating system that includes all software needed for basic computer literacy skills. However, C4L is still in the process of sourcing the necessary funding for the shipping of the equipment and setting up the lab facilities with the relevant furnishings and supplies. MiddStart funding will facilitate the successful implementation of the projects in Ethiopia and Zambia. – Facilitate a weeklong basic ICT instructor-training workshop – that will be tailor-designed with the aid of the Cambridge ICT Starters Curriculum – for Betasab’s local volunteers. We are asking for $2000 toward the total estimated costs of $10000. The costs include travel, lodging, equipment shipping and handling, and computer lab setup expenses. We plan to communicate with our donors through email. Donors who want to follow up with the project can use our official website – www.computers4literacy.org – or stop by our Old Stone Mill office to see the equipment before we ship it. or operators. So it is a great opportunity especially for students to make their future bright. Thank you very much for all your kind donations so far. We can use the funds to ship the equipment abroad. But we still need more funding to successfully implement the project (set up the labs locally, furnish them, secure them, train instructors, etc.). Please note that we are still fundraising for the final implementation part. More details and PDF documentation are available on http://www.computers4literacy.org/blog — thanks a lot! Please be sure to add a note that indicates the gift is for “MiddSTART – C4L”. This is a phenomenal project. It takes an understanding of the world for people to reach for the stars, and improving computer literacy in places where it is needed most is a way to connect with the world. As a Middlebury alum, I have full confidence in the fine work being done by these Middlebury students and their efforts to make manifest this project. It is through such efforts that orphaned and vulnerable children can find hope in a future that is more than, that is better than what others may once have regarded as their fate. And that’s a future that we all benefit from because it brings us all closer. Communication is the key. Computers facilitate communication in the world today. By providing the tools and the training for proper computer literacy, this project can give voice to others who would be hard-pressed to find a platform from which to speak. This is the platform. This is the basis. The students who will benefit from this project can and will take it from here. Soon, with the help of this project, the microphone will be in their hands. Thank you very much David for your kind words and the support. We share your opinion and like your ‘microphone’ metaphor. The ‘microphone’ will be both local and global. On the one hand, we will be supporting the socio-economic development of respective communities where the C4L labs are set-up. And on the other hand, we will make them connect on the global level. You might like the useful information posted on our blog. Please visit http://www.computers4literacy.org/blog to learn more about this important topic. C4L is revolutionary and you guys are doing great with it. I think this is just another thing that this region needs. Young children certainly need exposure to computers lest the struggle to change the developing world for the better yields little or no progressive results due to the simple reason of backward technology ( granted it could be complex) Go go go……. Thank you all for your generous gifts. We sincerely appreciate your support!